One of the best natural ways to put finishing on furniture is by staining wood with coffee. It makes for an easy, cheap and surprisingly attractive finish if done right and with care. As long as what you plan on staining hasn’t already been finished and varnished, you can use things that can be found in pretty much any house to give it a classy, unique finish. So go raid the cupboards and let’s get started. Used coffee grounds. The darker the better. Put the steel wool into the container, and top with one quarter cup of coffee grounds, and a cup or two of vinegar. Give it a vigorous shake and leave to stand overnight. Once the first coat is applied, give it 20-30 minutes to dry, then apply more coats as needed. Two or three coats is good for a standard finish, with four or more leading to a very dark finish. 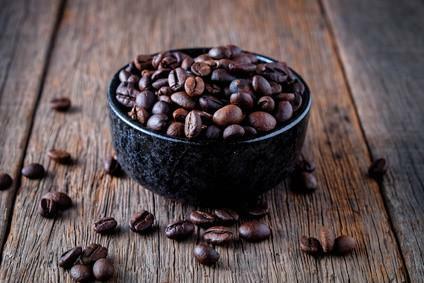 Once the stain is applied and dried, optionally treat it with a light layer of varnish to seal and lock the stain in..
Place the coffee grounds in a container, then add the water and leave for at least half an hour. Using the coffee filter and strainer, carefully pour out your mixture and throw away the grounds. Optionally, sand off the material you want to treat. Sanding it opens up the surface and gives the stain a greater surface area to cling to and absorb into, leading to a nicer finish. Start staining. Dip the brush in, give it a second to absorb. Then using even, steady strokes, brush the stain onto whatever it is that you’re staining. Leave to dry for half an hour between treatments, and repeat as necessary. First off, they’re natural. A lot of stains you’d buy in a hardware store are full of chemicals, and very aggressive both on the body and the environment. This method uses all natural ingredients, and just takes a little elbow grease and creativity. You can use things that are found in almost every household. Pretty much all of us have vinegar and coffee in the cupboards. The finish is exceptional, and completely in your hands. A pro tip here is to leave it to mature for a few hours between subsequent applications of the stain, because it gets darker as it gets older. Have we piqued your interest yet? I bet you’re itching to get out there and start working on your DIY project. You’ve probably already started thinking about all the things you can stain, and how much better they’re going to look when they’re done. Well, the single best thing you can do, and the thing we recommend most? Experiment. Grab a piece of scrap wood and treat it first, to see how it turns out. Use a little more or a little less coffee grounds, and just play around. The world is your oyster and you’re the creative here. And once you’re done running around your house staining wood with coffee and making your masterpieces, come back here and tell us how it went. We’d love to hear about it.